Thanks to photo apps like Instagram and VSCO, filtering and photo editing has become very popular. It's also one of the topics I get asked about most, and I truly believe that post-processing (i.e. editing) is part of the creative process of photography. Editing allows you to enhance the photo and give it your own look and feel. If you look at a photographers portfolio, you'll be able to tell that all photos have the same look and feel. This comes from both the types of photos they are taking but also from their lighting and editing styles. The straightening tool is probably one of the most used tools of any photographer. Straightening lines or objects within a photo is a subtle change that makes a huge impact. For me, I can be pretty obsessive about straightening and if lines in a photo are off, I can’t focus on anything else. Straightening photos is especially important when there is a clear line in the background, such as a horizon line. The straightening tool can be found in any good editing app or software and is usually located with the cropping tool. In the before and after below you can see that the difference is subtle yet important. Increasing or decreasing the exposure or brightness is relatively the same thing. Depending on which program you’re using to make your edits, you’ll likely only have one or the other. Sometimes there may not be as much light available as you'd like to make your photo bright, or alternatively there may be too much brightness and your photo looks washed out. By increasing or reducing the brightness, you can create the lighting that works best for your photo. In the following example, I wanted to increase the brightness. You can judge how bright you want to go based on what looks most visually pleasing to you. Contrast refers to the difference in tones, from the lightest (white) to the darkest (black). High contrast means the blacks (dark areas) are really dark and the whites (light areas) are really bright. When there is low contrast, an image can appear like it has a gray tone to it. Increasing the contrast can really sharpen an image and add drama by making a strong distinction between the light and dark tones. Shadows are the areas getting the least light. You can play with the shadows on each photo to see what looks best to you. It's also another way to add or reduce light to an overall image. By increasing the shadow light, you are adding light to the shadows which brightens the image, and also as a result reduces the contrast because there are less dark areas. Because it takes away the contrast, it can give photos a softer look. White balance is a photography term that refers to the colour temperature of a photo. The goal is the have the white balance look closest to how we see it with the naked eye. Sometimes your image may look a bit cool (blueish tone), or a bit warm (yellowish tone). By adjusting the temperature you can change the photo to match how it looked in real life, or how you think looks best. In this photo, I added some warmth as the blue lake was creating a cooler tone, but I want it too feel like the warm summer day it was. 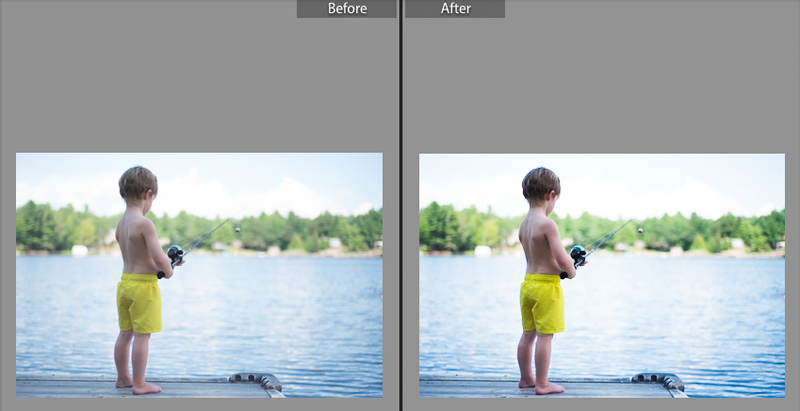 I hope that these 5 basic editing tips help you make your photos pop! You may not need to use them all on every photo, but you can play around with these settings to create an image that you love. Here is the before and after from these 5 editing tips.